If you’ve contacted Chinese suppliers you may have noticed something lying under the surface of all of your emails, conversations, and wechat message exchanges. Sometimes it’s not just what is said but what is UNSAID that matters more. This is the case in doing business with China. The concept of Guanxi is one of the most important factors of successfully doing business with China. 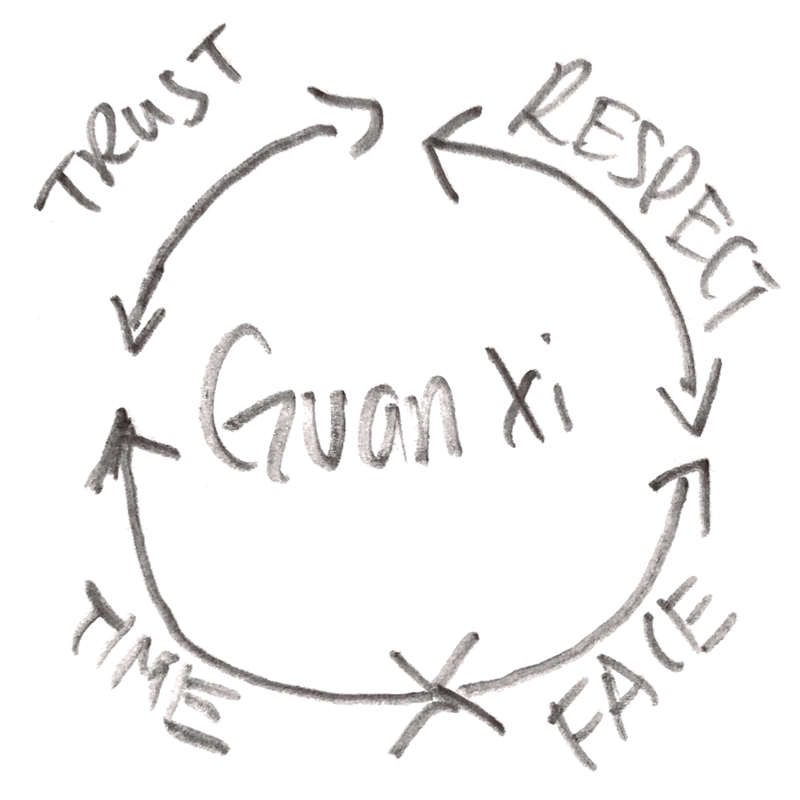 Guanxi can be literally translated as relationships or connections. And in China Guanxi is the basis for business and personal interactions. As a American based in Shanghai who’s worked with hundreds of Chinese suppliers over the past 10 years, I’ve noticed 4 key factors that Guanxi boils down to: Trust, Respect, Time, and Face. The more you have of each factor the greater the Guanxi you have with your partner. Why is it important to build Guanxi with your Chinese supplier? Better pricing – the better relationship you have with your supplier and the more they trust you, the more likely they are to offer lower prices to you. It makes sense because they value your business and a lower price will make it more likely to keep your business. Let’s take an example of sourcing widget A from a supplier. I’ve worked with them beginning in 2016 and have secured a FOB quote of US9.90 to start. Over time as order volumes grew, I was able to negotiate the price down to $9.70/pc. Because of my strong relationship or Guanxi with this supplier as I’ve ordered over $100k of inventory over time, they are willing to maintain this pricing for me. If however you were to approach the same supplier today, they will quote you over $10-$11 for the same item. Why? Because you are new to them, you have no past track record, and they don’t know or trust you. Better Guanxi = Better Prices. The same rule applies to minimum order quantities or MOQ. Because of the greater trust, the more they’re willing to look past the short term lower initial order and more towards the long term business relationship with you. And this doesn’t happen with someone you’ve just met on Alibaba. Normally initial payment terms suppliers offer you may be a 30% deposit and 70% due before shipment. As I build Guanxi with suppliers I’m able to get payment terms in 0% deposit and balance due upon shipment. In other cases you can get even better payment terms of Net 30 or Net 60 and this really helps free up your cash flow. But this can only be obtained through trust, respect, time, and face in the form of Guanxi. Though not 100% failsafe, as a general rule the better the Guanxi you have with your supplier, the less likely they are to reveal your designs and intellectual property to competitors or knock them off and sell them as their own. Obviously it’s smart to have contracts in place to protect yourself. And having a strong relationship or Guanxi in place will help cement the deal. Murphy’s Law states that whatever bad can happen will happen. Product defects, mistakes, delays, etc will happen to everyone. The frequency of this can be reduced with greater Guanxi. Over time, my relationship with my supplier has put more pressure on them to deliver according to plan. They know that my business is important to them and they will put in the extra effort to make sure that their engineers and production line managers pay more attention to my order when the time comes. Sometimes having good Guanxi is almost like having a friend in the factory. When my inventory is running low and I need my order expedited, sometimes my sales representative will be able to shave a few days off the delivery time. I’ve built a positive relationship with him over time. The more clout or Guanxi you have with a supplier the more willing they are to listen to your requests to tweak the product. Or to create custom packaging. For example to add my company logo engraved onto the product (for free), to print my custom designed packages, and to consider my feedback in future product designs. On the other hand, someone without Guanxi may get ignored by the supplier if they made the same requests. In conclusion, building Guanxi with a Chinese supplier is like the concept of reaping what you sow. You will need to plant the seeds, and take care of them, water them, and make sure they don’t dry out to grow the relationship over time with your supplier so you can reap the benefits later. Conversely, if you walk into an empty garden from day 1 and try to make a big harvest you will be disappointed. You cannot expect to harvest anything without investing work and time into it. What happens if you ignore Guanxi? This means that you are fighting an uphill battle. When you try to negotiate for lower prices they will refuse to budge. They may refuse your requests to lower MOQ (when it is possible if you play your cards right). They may refuse to cater to your requests for modifications to the product changes. They may even be more careless with your order production leading to more mistakes, defects, and headaches. Poor Guanxi may lead to longer lead times as their VIPs cut the line to get their orders delivered in front of yours. Also it may lead to poor communication, lower response rates, and overall difficulty in doing business together. 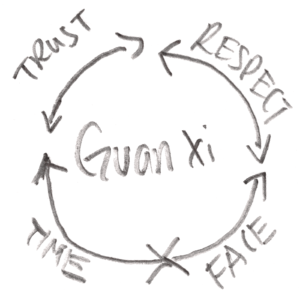 So remember to build Guanxi you will need to build trust, respect, and face, over time. I’ve created video course called 80/20 Sourcing Essentials that will show you the exact ways I build Guanxi with Chinese suppliers to build better business as you launch your initial private label product. This way I can get them to work WITH me rather than against me. When problems arise they are cooperative in getting them fixed so I can ship out my product and start selling. With pricing they say my pricing is much lower than the prices they quote to people that reach out to them on Alibaba. And this is just the tip of the iceberg. And I also show you what NOT to do so you won’t offend them and burn your bridges. These strategies took me years to learn based on my own successes and mistakes. One of the common mistakes I see newbies make is that they try to build Guanxi with EVERYONE. This is a waste of time. Just as in the dating game, you’re not trying to take every boy/girl out you see to dinner right? I hope not! Otherwise you are seriously wasting your time and money on the ones that are not a good fit. I will show you the exact signs of a trustworthy supplier that you will WANT to build a relationship with. And the red flags of suppliers you want to avoid so you don’t get scammed out of your hard earned money. Finally in terms of product selection I will show you the 11 ways to find profitable products away from the crowds. If you start out at the same place as everyone else you’ll end up at the same place as everyone else. I will show you methods that I’ve used to identify profitable products that I’ve used to build and scale 6 figure businesses with.